Battery powered security cameras can help you protect your home and business even without power supply and WiFi connection. The wire-free security cameras also free you from running wires inside or outside your property — No drilling & no cables! You’ll get a complete guide here to buy the best battery operated security cameras — every detailed feature included. Also, you’ll get a step-by-step guide to install battery powered security cameras for any places with/without Internet. We’ve included almost all the features you may wanna get in a battery operated security camera. You can check the below features you care about most to buy the smart home security cameras with battery backup. Battery powered wireless security cameras depend on WiFi to offer you remote live streaming, motion detection alerts, etc. The WiFi range of the wire-free security cameras can offer you 250—450ft when there are no any barriers, like bricks, walls, etc. between the cameras and the router. Take Reolink Argus® 2 as an example. This battery back-up security camera runs on 2.4 GHz WiFi band, which offers you 250ft wireless range in open areas. A bonus of the camera is that it will not take up your broadband when it’s in standby mode. In other words, this camera will not slow down your network, when you don’t access the camera or when there are no motion events. Another battery security camera type uses SIM card to get Internet connection, so that you can check on the places you want even without Internet and power outlets. Here we would like to take Reolink Go as a typical example to show you how cellular battery powered security cameras work. This camera operates via 3G/4G cellular network without relying on a dedicated router realize data transmission. Wire-fee security cameras with weatherproof rating enable you to install the cameras even in the extreme weather without worrying about the rain or cold. IP (Ingress Protection) rating defines the effectiveness of the enclosures of the security cameras against the dust and water. Take battery powered security cameras with IP65 rating as an example. “6” means that the enclosure can protect the camera from dust that may harm the device. “5” indicates that the housing can prevent the camera against the water jets in all directions. Also, you can have an overall impression about IP rating in battery powered wireless outdoor security cameras in the below chart. *X means no data available to specify the rating instead of no protection. Actually, they are higher protected than level 6. All in all, you are gonna need at least IP65 splash or rain-proof battery operated CCTV cameras if you place the cameras outside, like catching vandals in your neighborhood, or catching naughty kids kicking down the fence boards to go through the garden or park. You can see how an IP65 battery powered security camera braves the snow in the video below. For example, you can place a battery operated outdoor security camera on your front porch, so you can confirm that your package has been delivered to your home. You can check if there is someone approaching your property, or anything unusual outside your home, and decide what to act. Battery powered outdoor & indoor security cameras with smartphone app offer you remote live streaming and video playback via your iPhone or Android smartphones wherever you are. 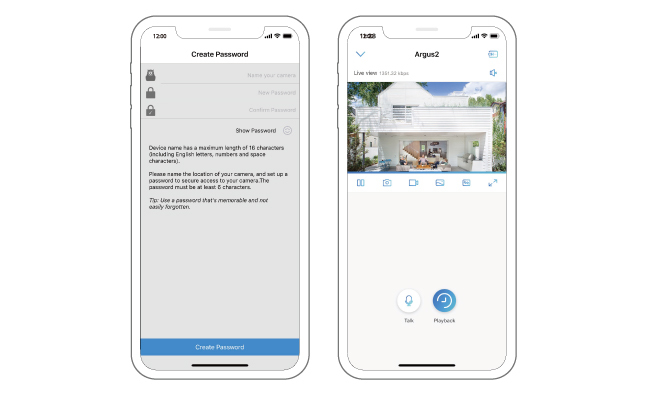 There are 2 main software you can use to access your battery powered wireless security cameras or systems: the customized manufacturers’ app and third-party software. Battery wireless outdoor and indoor security cameras with customized software would be a better option, compared with the pay-to-use third-party software. Let’s take Reolink App as an example. 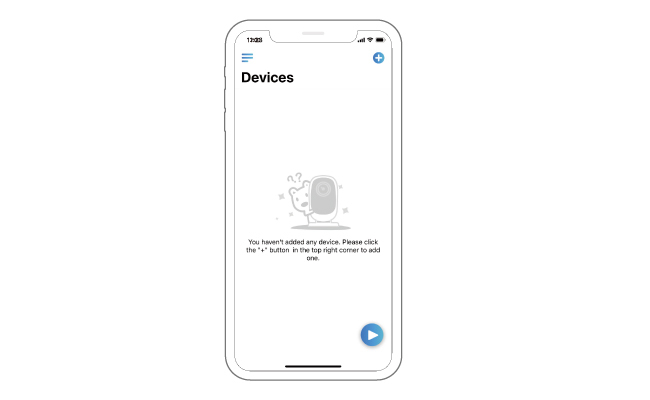 When your battery operated wire free security cameras are in the same network with your iPhone or Android mobile phones, you can access your camera simply by launching the app. The interface of Reolink App is also extremely intuitive. Even your grandma can use it without any issues. FYI: We’ve also got a blog that covers all the useful information about battery powered security cameras with smartphone app. Click here to read. Battery powered security cameras with night vision typically include 2 types: infrared and starlight night vision. The security cameras with infrared night vision enable you to see things extremely clearly even in complete darkness (0 LUX). When in night time, the infrared-cut filter in the battery powered infrared security cameras will automatically let more lights in to produce much clearer night vision images. In some cases, burglars would turn off your lights to intrude your home. Battery powered wire-free night vision (hidden) cameras can capture the invaders’ images perfectly without any lights around. With the clear images, police can help you catch the bad guys more easily. Battery powered security cameras with starlight night vision are the newest CCTV camera type in the market. This type of CCTV cameras can make the most out of natural light to produce superior images, and offer much clearer and sharper night vision images compared with the infrared type. You can take look at the below high-quality color night vision video captured by a starlight WiFi battery powered outdoor security camera Reolink Go. Battery operated security cameras with memory card can offer you video recording for your property even without power supply and Internet access. Battery powered outdoor & indoor security cameras with SD card are a cost-saving way to store motion videos. Some wire-free security cameras also offer you cloud storage to record motion videos. You can play back the recorded videos to see who and what triggered the motion events. If there is a thief breaks into your property, you can keep the video recording as the evidence to catch the bad guy. Let’s take a look at Reolink Argus® 2 battery operated CCTV camera. This camera comes with the onboard SD card slot, so you can insert the memory card to record the important motion events you want. Also you can opt to the cloud storage (currently it’s in beta testing status and only supports US). Unlike some of battery operated home security cameras force you to bind the cloud storage to get video recordings, Reolink Argus® 2 offers you 2 options to store videos, you can choose whichever you prefer. If you want to have further insights on battery powered security cameras with memory card, click this post to get more details. Battery powered HD security cameras enable you to view and record crystal clear images without missing the important details, like license plate and human faces. That’s the main reason why the police recommend home and business owners installing HD security cameras to identify the criminals should a danger happen. As you may know, some battery powered security cameras produce HD images at the cost of battery life. Those innovative security camera manufacturers (such as Reolink) noticed such limitation, and kept developing the technology in this field, and they succeeded! For example, Reolink Argus® 2 uses Sony 1/2.9″ CMOS sensors to produce 1080p Full HD images without compromising the battery life. You can watch the below video to see the high definition of Reolink Argus® 2 wireless battery powered outdoor security camera (shared by a customer). Reolink Argus® 2 offers you both 1080p and 720p HD video streaming. If the Internet connection is not stable, you can lower the stream to get more fluent real-time live view. The sweet Reolink engineers added a tip on the smartphone app. The app will give you a prompt advising you to lower the video stream, when your WiFi connection is not in good condition. Wireless security camera battery life would be one of your biggest concern. You should get a security camera with long-life battery backup in order to save your trouble on changing the batteries. 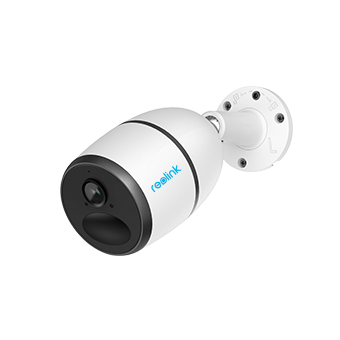 You can take a look at Reolink Argus® 2 battery powered security camera. This camera comes with a rechargeable battery, and can be connected to the solar panel to get continuous power supply. You can also buy another rechargeable battery for backup power supply for this camera. In the market, those battery powered surveillance camera manufacturers claim that the battery life can last 6 months or even a year, but the truth is that that the battery drains in just a week. You can check the battery powered wireless security camera reviews of the professional editors from top-tier media, and the previous customers’ feedback before your purchase. The battery life may vary based on the settings, environmental conditions and other factors. You can try these helpful tips to maximize the battery life of your battery powered security cameras. Besides the above features, you may wanna look for the below points in your battery powered home security cameras & systems for your porch, job sites, remote rural home, etc. Below we list another 4 bonus points you may be interested in so that you can get more details you want. • Battery powered wireless IP security cameras with DVR or NVR: If you want to buy an NVR/DVR for 24/7 recording, it would not be a good choice. There are few remote battery powered security cameras that can support 24/7 video recording, since this type CCTV surveillance cameras will run out of battery extremely fast if you do continuous recording. In the market right now, most of the battery powered WiFi security cams only support motion detection recording and save the videos to the onboard SD card, or the customized video storage device (like the base station) and the cloud. With the motion detection recording, you won’t miss the important events while making sure your battery powered recording security cameras won’t drain within weeks. • Battery operated security camera recorders with motion detectors: Advanced battery wireless security cameras use PIR sensor to detect motions, which are clever enough to tell the difference between a branch swaying and a person coming into the detecting view. Avoid buying battery powered exterior and interior DIY security cameras with frequent false alarms, or the battery will drain soon within several days. You can check the below review of Sally, the professional tech reviewer of Tom’s Guide to see her remarks on a small battery powered outdoor home security camera in the motion alert part. • Wireless battery powered security video cameras with a monitor: Innovative CCTV surveillance cameras will offer you multiple ways to remotely view live streaming and play back recorded videos. For example, you can use your iPhone, or Android smartphones, Mac and Windows PC as the viewing monitors to access Reolink cameras with free Reolink software. • Battery powered security cameras with two-way audio can let you talk to your family anytime you like. Besides, if criminals invade your home, you can shout at them to scare them off. You can check more details about two-way audio security cameras here. No matter what battery powered security camera types you want to buy, dome, bullet or PTZ type, IP, GSM/3G cellular or Bluetooth types, you can find the best one for home use by following this invincible battery powered security cameras buying guide. No matter where you are, you can buy battery operated security alarm cameras for your home, car, and office on security camera online store. Besides, you can purchase the self-contained battery powered long range cordless security cameras on Amazon, BestBuy, Home Depot, etc. for your home or remote areas. Please note that the official online store would be the best place to buy your battery powered security cameras, since you can enjoy the best after-sales service and the product warranty. If you have any questions in the future, you can get online tech support 1-on-1! The tech support team will offer you the best services! In order to save your time in buying the high-quality battery powered security cameras with favorable prices, we list 2 best picks for your recommendation. If you want to buy a small outdoor DIY battery powered security camera, Reolink Argus® 2 is a perfect choice. It is now the most favorable wire-free security camera with great features in the market, ONLY $129.99! 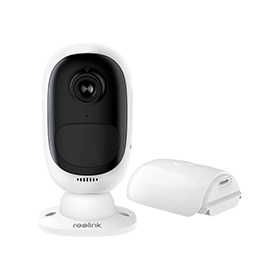 Unlike other battery operated security cameras needing WiFi connection to get live view, the 4G security camera Reolink Go, on the other hand, offers you real-time remote viewing without relying on WiFi connection and power supply. You can check other fantastic and charming features of Reolink Go in the below video. Battery operated portable security cameras are almost the easiest security camera option. You can configure this type CCTV cameras with several simple steps. Below we take Reolink Argus® 2 as an example to show you the step-by-step guide to set up the battery operated CCTV security cameras. Step 1. Install the rechargeable battery into this wire-free security camera. You will hear the verbal instruction immediately to help you set up the camera. Step 2. Download and launch Reolink App on your iPhone or Android mobile phones. Click the “+” button in the top right corner to add the camera. Step 3. Scan the QR code on the camera and then click “Connect to Wi-Fi” to continue. Step 4. Click “I have heard the voice prompt” to continue to the next page. Step 5. Enter the WiFi password of your WiFi network, and tap “I have entered the correct information” to continue. Step 6. 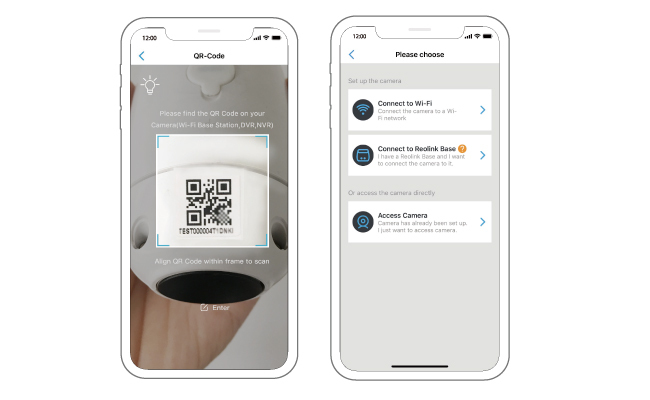 A QR code will be generated on your smartphone. Place the QR code on your phone to let the camera scan it. Step 7. Name your camera and create a password. Now you can get live streaming! If you have any questions on the battery operated security camera installation, please leave them in the comment below. We’ll answer your questions ASAP! We also make a Q&A list below so that you can get more details about battery powered security cameras. We will illustrate the detailed answers to the questions you may have on battery operated CCTV security cameras. These questions are either discussed on the forums or frequently asked by our readers. If you have other questions, please leave them in the comment below, we will add your questions to the list. How long do the batteries last in a wireless security camera? A 1: The battery life will vary greatly among different battery powered security camera brands, and personal settings, installation environments, etc. Typically, battery operated security cameras can offer you 1-month to 6-month battery life with proper settings. If you don’t want to change the battery for your battery CCTV cameras on a regular basis, you can add the solar panel to your cameras for non-stop power supply (make sure your cameras support solar power). Does CCTV work during power cut? Do all wireless security cameras need power? A 2: Wireless Battery powered or solar powered security cameras will keep working seamlessly even without power supply. Plug-in WiFi security cameras and other wired CCTV surveillance cameras, including PoE & analog cameras, will stop working once the power is cut. If you have backup battery, like a UPS and backup generator, for these security cameras that need practical cables to get power supply, these cameras will keep functioning when power is out. Q 3. Do You Need WiFi for Home Security Cameras? Do I need the Internet for an IP camera? A 3: Cellular security cameras operate over 5G/4G/3G network to provide remote live streaming, motion detection alerts, remote video playback, etc. without relying on dedicated router. Advanced all-in-one security camera systems can still offer you 24/7 video surveillance even without Internet connection. That’s because the cameras and the NVR connect with each other via their proprietary network. In other words, the security camera system will star working once being plugged into the power outlet. However, you cannot get remote access to this system without Internet connection. Standalone security cameras with SD card offer you motion detection recording when Internet is unavailable so you won’t miss the important events. This entry was posted in Buyer's Guide and tagged Battery Powered Security Cameras. Question from a computer/wifi challenged person. I need a battery operated surveillance camera. No internet access. Have an IPhone for an app. Am I able to use an app or will it have to be an SD card (not even sure what this is…thinking it is something that goes in the camera) that will have to be removed manually, inserted into a computer to be viewed? Sorry for just not understanding all of this…trying my best. Is there something out there for me? I was told to look at hunting camera’s…yes, no, maybe?? Hi Julie, thank you for your question. You can view the recorded video on the SD card on your iPhone directly. If you want to download or back up the recorded videos, you need to remove the SD card from the camera and insert to your computer. Let me get this right . I can buy the Reolink Argus without wifi modem nearby ,without any internet nearby . How do I view the recorded footage without any wifi ? Hello Nosmo, if the Reolink Argus is not connected to WiFi, you cannot access the camera remotely. However, you can still get video recordings. The motion videos will be recorded to the SD you inserted to the Reolink Argus. You can check the video recordings by removing the SD card from the camera and then play back the videos on your computer. If I can view footage remotely , how far can I be from the camera to do this ? Hello Nosmo, as long as your security cameras and smartphones are connected to the network, you can access the cameras remotely wherever you are.